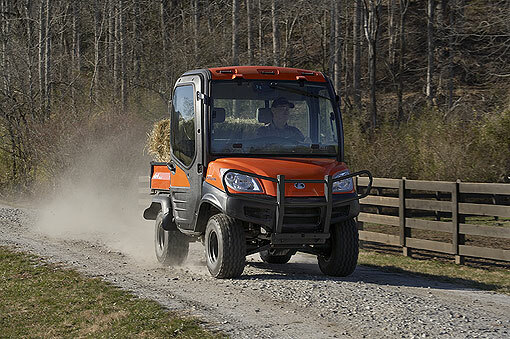 Sitting somewhere between a golf cart, an ATV and a tiny utility, Kubota’s RTV1100 is a curious-looking vehicle. But this fun little diesel-powered 1123cc delivers a new level of quiet, air-conditioned comfort, hard-working, all-terrain performance and roll-cage safety. These and other practical innovations should combine to make it a very popular vehicle for those who work on large, spread-out properties. Kubota are keen to emphasize the comfort level of their newRTV1100 Premium Grand Cab – it’s the first in its class to offer heating and air-conditioning as standard. 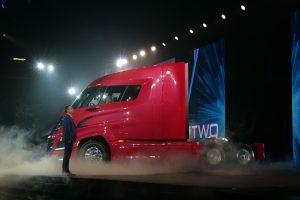 It features a unibody frame to ensure a smooth ride, enhanced stability, and is one of the industrys quietest cabs, with ride quietness of 83dBA at maximum rpm. The RTV1100’s twin-seat efficient cab design equates to less overall weight and it also meets OSHA 1928.53 and SAE J2194 Roll Over Protection (ROPS) standards. Not hot or cold enough for the heat or air conditioning? 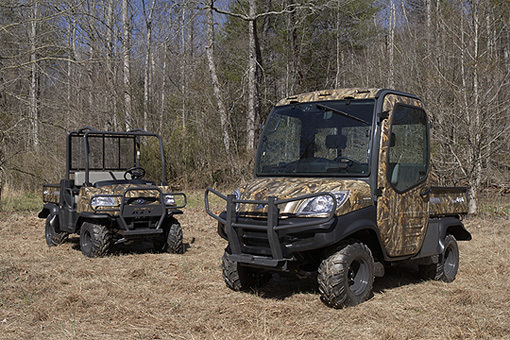 Let in some fresh air by utilizing the RTV1000’s one-of-a-kind two-position lock. Located on the driver’s side door, this ingenious lock allows the door to lock in a slightly open position, called ventilation mode, allowing the air flowing from the front to continue on through the cab and out the door. To complement this, the front windshield easily opens outward t allow air to flow through the bottom and sides. In airtight mode, the door is completely closed and the cab is sealed tightly for efficient air conditioning and heating use. The luxury cab of the RTV1100 is built around a single frame, which means it is more airtight, more soundproof and experiences almost none of the shade and rattle sometimes associated with after-market enclosures. The RTV1100 boasts a high-quality air conditioner, heater and defogger, which makes it perfect for work in cold or hot and humid areas. Interior aside, the tiny vehicle was born to work, its 1123cc diesel motor producing 24.8 horsepower and a class-leading 50.3 ft-lbs of torque through the innovative Variable Hydrostatic Transmission. 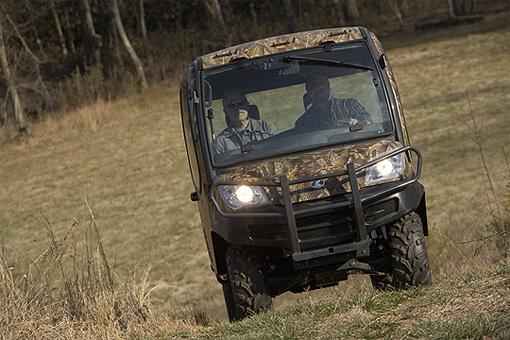 Four-wheel disc brakes, independent front suspension and power steering lift it easily into the realm of a full-size utility for handling – and its wide tires and 7.5″ ground clearance make it suitable for tough terrain. 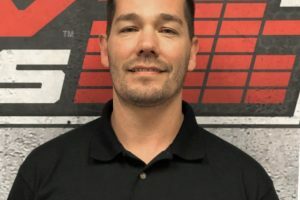 The cargo bed, large enough to carry a four-foot pallet and strong enough to lift 1100 pounds of weight, lifts and dumps via a hydraulic bed-lift system operated by a single lever. A Kubota exclusive! 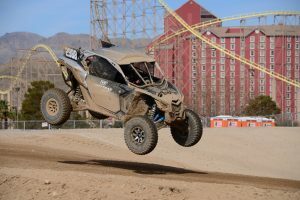 The RTV1100’s high-performance, three-range Variable Hydro Transmission ensures that you have the traction, acceleration and power you need to complete even your most heavy-duty tasks. A range of accessories are available, from trailer hitches and backup beepers to high-powered work lights and a dashboard CD player. 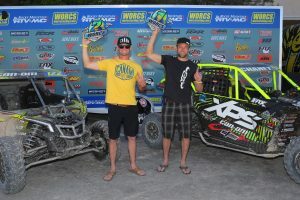 This little RTV sets a new standard of specification in its field. You don’t have to rough it to work on the land anymore! 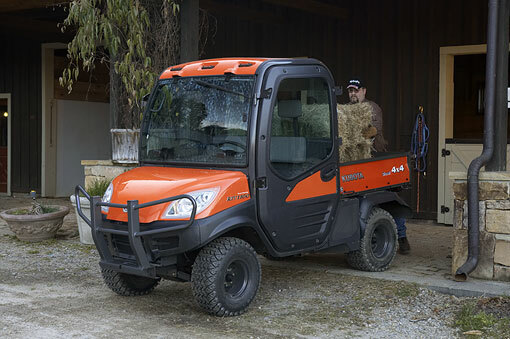 The Kubota is available now through U.S. retailers and priced at US$16,999. Kubota Corporation of Japan was established in 1890 and is known for their agricultural machinery (tractors, mowers, etc. ).